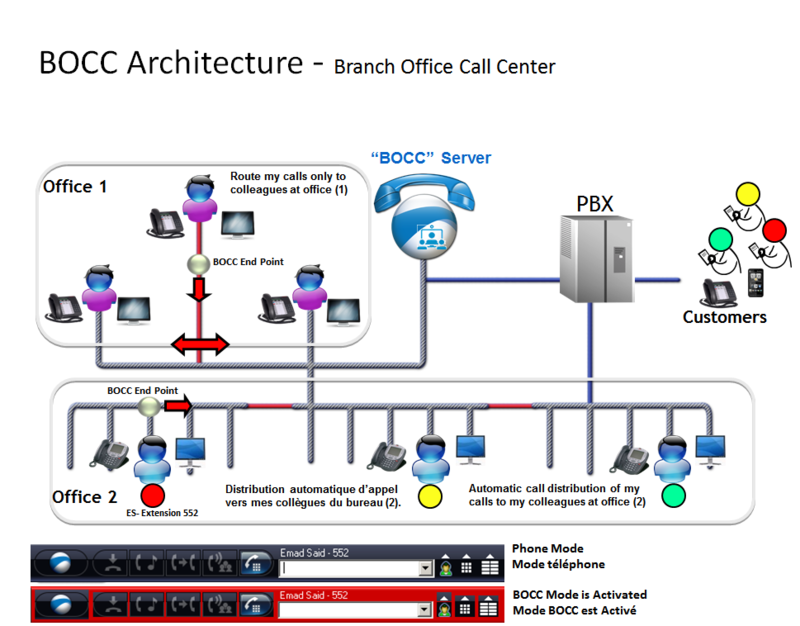 BOCC (Branch Office Call Center) is a software-based call distribution gateway which enables users "On-demand" to automatically route their inbound calls to specific internal colleagues or group of users. BOCC server routes calls to the first available colleague or to colleague with an appropriate skill in an order of priority defined by the user. This allows workloads to be balanced between colleagues and enhances the customer experience by ensuring prompt and professional service. Colleagues' availability is determined by combining their personal availability, computer presence and telephony states. BOCC features could be activated in toggle mode in liaison with the user desk phone. Hence, in case of user absence, he can turn his phone to act as a personal call center "a mini office ACD" to dynamically route his inbound calls to appropriate colleagues. A sophisticated, flexible and personal ACD mechanism easy to manage; fully controlled and activated On-demand by the user according to office requirements. Business Continuity assurance in case of user absence or unavailability. Corebridge BOCC provides an intelligent Routing tool without the need of an IVR system or call-waiting queues, which can vastly improve the quality of customer service in any such situation. BOCC delivers Automatic Call Distribution, Agent Management, and Data Logging across the entire organization. This enables traditionally expensive Call Center-like functionality to be enabled within teams or support centers.